There was a moment halfway through the youngest’s 9th birthday party that my ex and I stared at each other in terror and wondered how the hell we were going to keep 12 sugared-up tweens occupied for another 90 minutes. But suddenly it was 4.30pm and pool cake time and soon after the mums and dads started arriving to collect their offspring and it was generally agreed a bulk fun time was had by all. Except perhaps my lovely friend Alice, who will be spending today hosing blue jelly out of her backyard. I’m not sure a bunch of flowers and a bottle of red really makes up for that. But thank you Alice, your place was AWESOME. 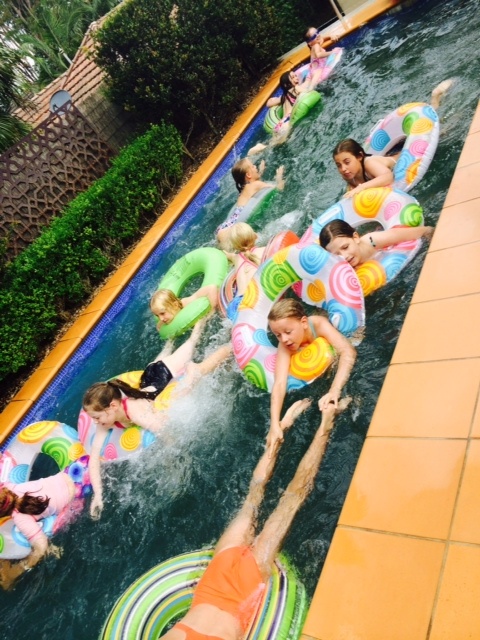 The weather wasn’t fantastic for outdoor fun, so the pool was a bit chilly, but the kids were game and much shrieking and splashing ensued. The blow-up rings from the eldest’s party last year got another work-out. As did the grass skirt. The youngest requested her cousins’ party punch recipe, which I obtained from her aunt. When I told her the ingredients she make me promise not to tell any of the kids because she was worried they wouldn’t drink it. 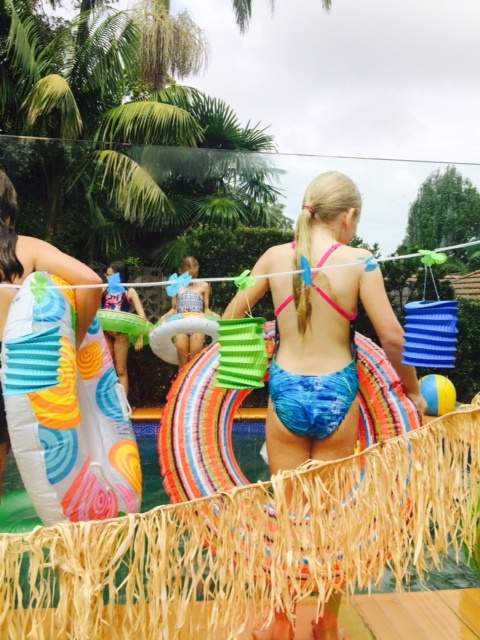 Blithely unaware, they hoovered it down through straws with built-in party umbrellas! 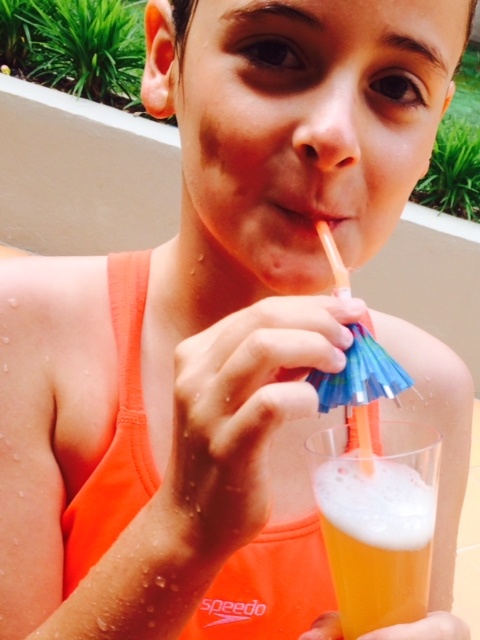 The recipe: 2L lemonade, 1L ginger ale, 1L pineapple juice, 1 cup cold tea, 1 small can passionfruit pulp, lots of ice. 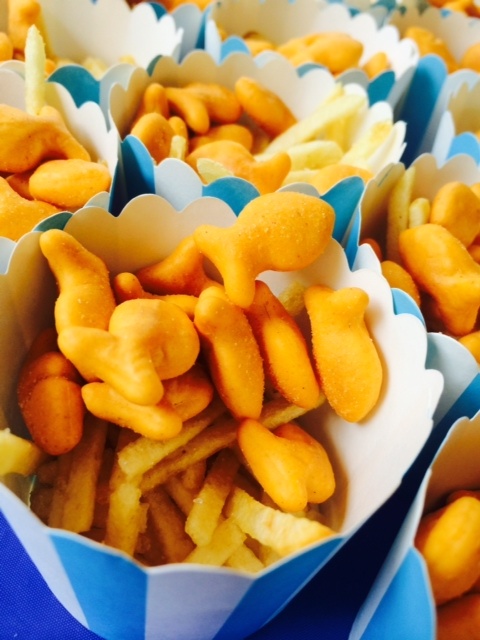 “Fish & chips” in stripey cardboard muffin cases. 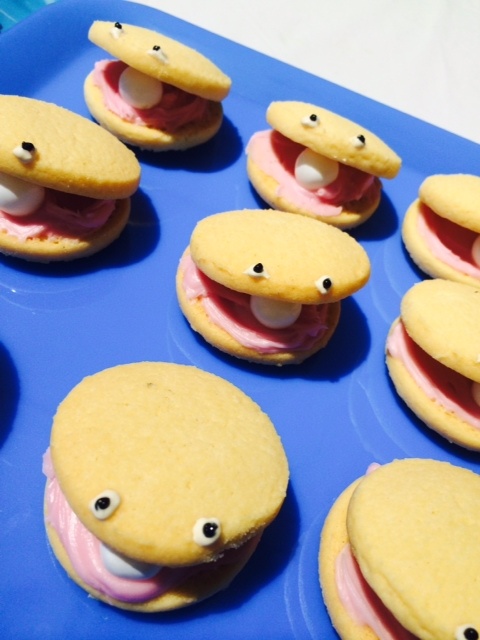 Shortbread clams: 2 shortbread bikkies with strawberry icing and Kool Mint pearls. 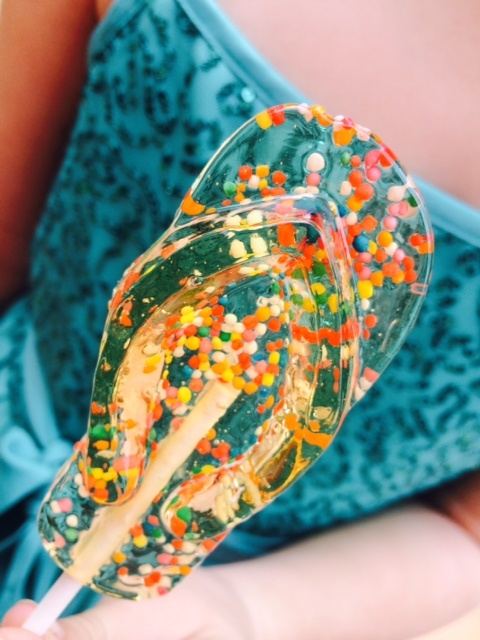 Toffee thongs: I have confectionary moulds I bought years ago – as you do – in the shape of thongs and just used a bog-standard toffee recipe, poured into the moulds instead of patty cases. They were a huge hit. 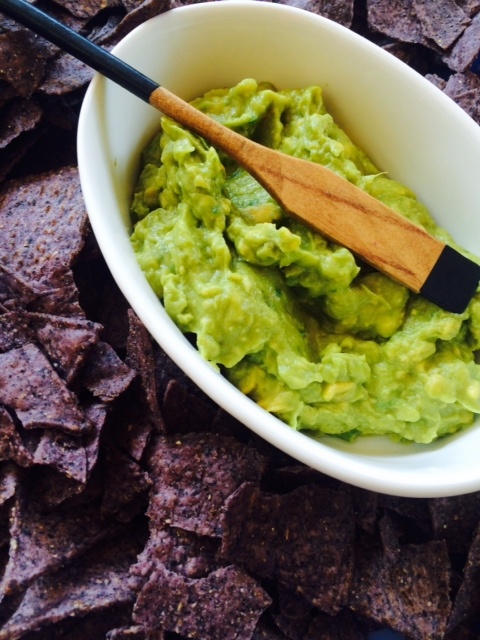 And guacamole boats on waves of blue corn chips. 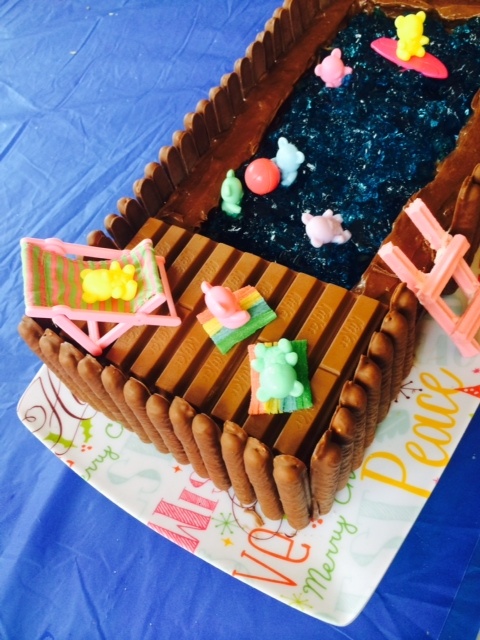 The cake: this is my take on the AWW pool cake. I added a Kit Kat deck and swapped the green jelly for blue. Easiest. Party. Cake. Ever. Just two rectangular double sponges from Woolies, with a pool shape cut out of the top sponge, covered in pre-made chocolate icing and decorated. There was much ooohing and aaaahhhing from the partygoers. Please excuse the Christmas tray it was served on. It didn’t fit on any of my silver cake boards. 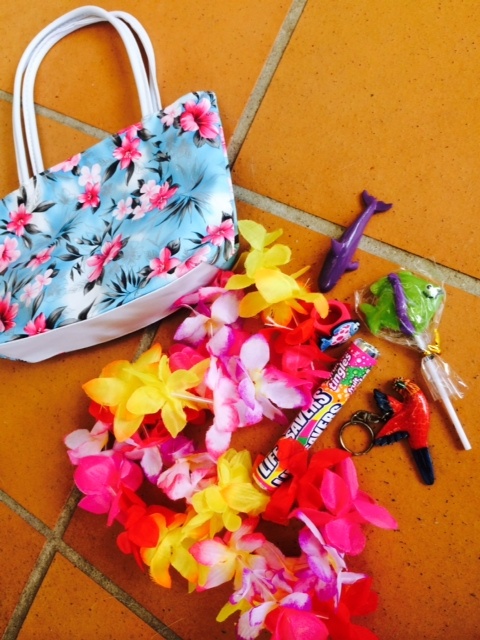 The party bags: purses from ebay with $2 shop leis, rolls of Lifesavers, bird keyrings, rubber fish rings, plastic sea creatures and tropical fish lollipops. 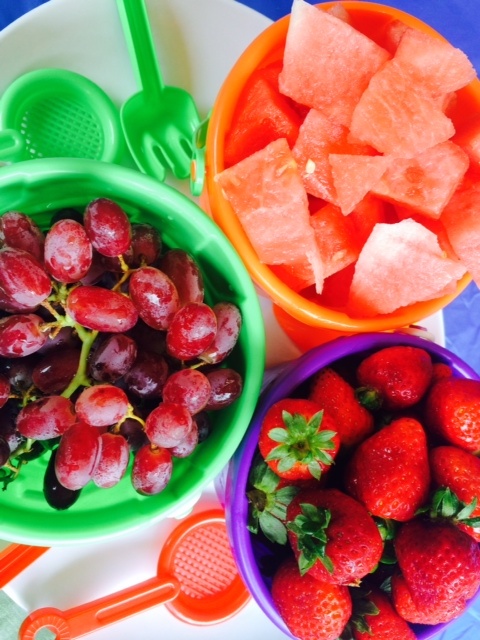 That sounds like a fun sort of party too – kids love to tumble around and have a snag. Tremendous effort and it looks fab. Congrats. Yes u shld… i want an alana 50th!!! Wow. So creative the way you presented the snacks. And I bet you had fun decorating that cake – it is stunning! Well done. I just love how everything ties together so beautifully. I’m sure the girls were thrilled with those Hawaiian-style purses too. the pics are amazing. do not, under any circumstances, let poppy ever see these.